What could be better than spending a long summer day splashing around in the pool with the kiddos?! Not much! To make sure you’re having tons of fun in the sun, use these tips to help keep everyone safe in the pool this summer. Learn to swim. Enroll your kids in swim classes. This will help them become more comfortable in the water but it will also help build their confidence with swimming. 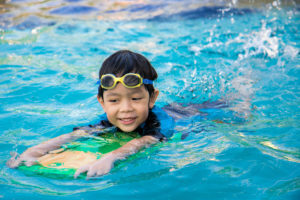 Also, by enrolling your child in swim classes they will not only learn different swim strokes, but they will learn how to get to the side of the pool as well as basic water safety. It’s important for adults to know how to swim; especially if they are the ones who are responsible for watching the kids in the pool. Swimming is fun but more importantly it’s a lifesaving skill to have. Learn CPR. Familiarize yourself with what to do in case of an emergency situation. CPR varies slightly for adults, children, and infants under 12 months. Often times there are free classes locally or you can take a class for a minimal cost through a hospital or the American Red Cross. Set pool rules. Swimming is a fun, family activity but safety always comes first. Enforcing rules like walking only near the pool or no diving into the pool can help prevent accidents. If you have a pool at your home, it is extremely important to have a pool cover and gate around your pool. Self-closing, 4 foot tall gates are recommended, it’s both convenient and safe. This not only protects your kids but also neighbor’s kids or pets that may wander into your yard, even if you aren’t home! Avoid drains. While in the pool make sure your child avoids playing around the drains or suction outlets. Suction may not feel strong to adults, but can be overpowering for a little one and there is an increased risk for one’s hair or limbs to get stuck in these outlets. Nothing can replace adult supervision. An adult’s undivided attention is needed when children are swimming. Never leave a child unattended in or near the water. Even if you aren’t swimming, a child could be reaching for a toy and fall in. While in the water, a general rule is to stay within an arm’s length away from kids 5 and under. While accidents can’t always be avoided it’s good to take all the necessary measures to prevent them. Playing in the pool is meant to be fun, it only takes a few steps to ensure everyone is safe. Want more info on children’s development and safety? From the beach to bee strings, use these tips to keep your kiddos safe and sound this summer. 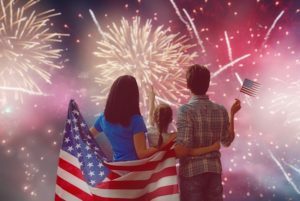 Try these 7 Tips for a Sensory Friendly 4th of July! Previous Previous post: When Will My Baby Smile?